BRACKNELL, UK. 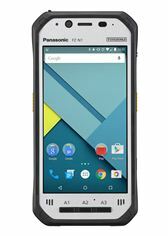 25 JANUARY 2018 – Panasonic today appointed global technology provider ScanSource to help accelerate its growth in the European rugged handheld market. ScanSource has been a long-time partner with Panasonic in the United States and will bring its extensive experience to support Panasonic’s business in the rugged handheld market, where it aims to build on its leadership in the European rugged notebook and rugged tablet market. In addition to the ScanSource appointment, Panasonic will be launching a dedicated handheld channel programme, called Edge, designed to support and incentivise value-added resellers (VARs) in the sector. The Edge programme will offer resellers dedicated marketing, sales and technical support in return for meeting qualification criteria. VDC Research reported Panasonic year-on-year growth of 176% in the rugged handheld sector in 2016. Devices such as the Panasonic Toughpad FZ-F1 & FZ-N1 handheld tablets, with their unique angled rear barcode reader to protect against repetitive strain and enhance user productivity, have already begun to establish a reputation in industries such as transportation and logistics, retail and manufacturing. ScanSource is a leading global provider of technology products and solutions, offering pan-European shipping to more than 65 countries, specialised technology teams, 24/7 online ordering and a range of value-added services for its channel partners. ← GDPR Befine Solutions assessment: All questions answered?